My New Transport Foster Kitten -- Phantom! Talkative Loud Baby Rescued Kitten! Two Cats Tuesday: How We All Watch TV Cuddled Up! Oh, the cuteness continues! I am pretty sure that my spare bathroom could easily be considered one of the cutest places on Earth in the past few months... There is always some cutie in there! The latest adorable thing to bless me with its presence is Phantom, a super sweet 10-month-old kitten that we rescued from Broward County Animal Control. 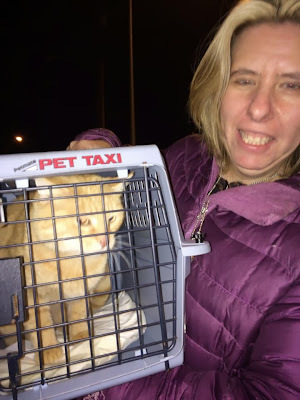 Phantom was THISCLOSE to being out of time, but we swooped him out of there just in time! Phantom's handsome shelter picture (that does him NO justice). He has white whiskers mixed in with the black on one side of his face... So he is Phantom! Phantom also has some kind of issue with one of his back legs. The shelter vet thinks it's some kind of nerve damage, but it doesn't seem to faze him at all! He walks with one leg kind of bent at the knee, like he walking on his calf. It all just goes flat on the floor. But he still jumps and loves and plays -- nothing is wrong as far as he is concerned! He is also extremely hard to get a good picture of, because he's constantly rubbing on me for love or coming at me to ask for more love. Sit still, Phantom! I'm sure there will be tons more pictures of him coming soon. I just wanted you all to meet him real quick. I love, love, love him and I'm so glad we could save him. I have been hoping and sharing for almost two weeks! Oh hai. You are here to pet me, right? Phantom still doesn't have a forever home 100% lined up, so if you are interested in him, please tell me! You can email me through the Contact Cute link on the left of this page or fill out our adoption form. Phantom is currently in Fort Lauderdale, FL, but we can transport, of course, with our Cute Transport Network! The nice lady gave me a catnip candy cane! P.S. You may have noticed the new links at the top of the page! Trying to make Cute Transport Network more official and help so we can spread the word easier and sign up more drivers easier. There are links up there now to volunteer to drive, and also to sponsor a transport kitty! 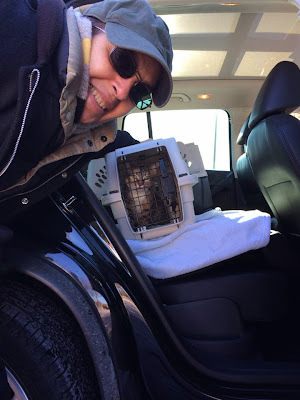 I'm going to try and keep the Sponsor a Transport Cat page updated with what kitties we are trying to save and what it costs to vet them and transport them. We usually pay a lot out of our pocket, so this will be a huge help so we can save even more! If you can ever spare a dollar or two, take a look and see the cuties that could use it! There are three listed there now, and I'll be adding Phantom soon also! Hurray! Mew was found on the streets by his owners just a few days before this video, and he's already making all of his demands known! Didn't take very long for him to show everyone who was in charge there, huh? He's skinny in this video, but check out the second video below to see how much Mew plumped up after finding such a good home! Maui the tiny little white kitten just loves to knead the bathroom rub. She kneads and kneads and is making the sweetest biscuits! Happy Two Cats Tuesday, Cuteheads! Just a quick one today -- I wanted to show you how we watch TV every night! Pimp has his spot. He always likes to curl up at one end of the couch. Both ends are his, it's just really whichever he feels like that night. Moo like to be THISCLOSE to me all the time (he's my velcro kitty), so he is always on my lap. Once I sit down, I'm pretty much stuck. What a cute and silly video! This is the story of a lady cockatiel who had a little bit too much fun one night... and then we get to have all the fun watching her babies (Oops!) grow up! I can't believe how fast they grow up. They are bigger and bigger every single day! P.S. Check out the little cutie over there on the right -- Little Ducky! She is a tiny thing and the latest baby we rescued from the shelter yesterday. I went to bust her out of there myself, and she is going on our next transport! You have to see her video on the fundraising page. So cute! UPDATE: Ducky's fundraiser got full (yay, thank you!) so I took it off the sidebar, but here she is! Isn't it the cutest to see doggies and kitties loving on each other and playing with each other and just being adorable best friends? Here's a cute compilation of some of the best buddies! And isn't it EVEN BETTER to see happy former shelter kitties in loving forever homes? Yes! 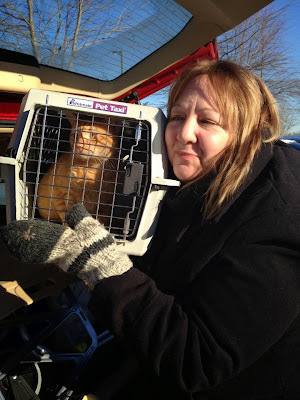 Here are pictures of all our transport kitties from the #9catcaravan in their forever homes and rescues! Captain Black and Captain Jack with Debbie (on the left) from Safehollow rescue in Georgia! 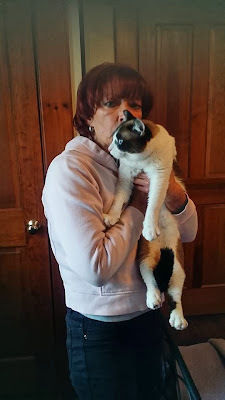 Cross-eyed George with his new mom, MaryAnn G. in Virginia! Audrey safely tucked into new mom Azar A. 's car to head home to Virginia! 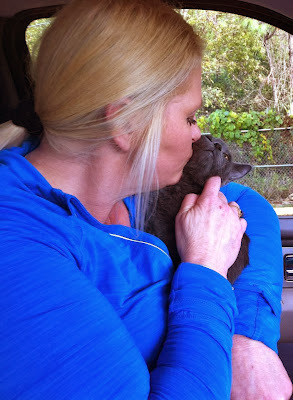 Princess Pansy Rose with her happy new mom, Laura F. in Boston! And let's not forget Sebastian with his new mom, Michele in Virginia Beach! Thank you to all the Cutehead drivers and fosters and cheerleaders for making this amazingly heart-warming trip possible! And thank you for Mother Nature for clearing out that blizzard in time for us to hit the road! P.S. We're working on lining up another transport of EIGHT kittens to Wisconsin, so keep an eye out for updates and cute pictures of those lucky kittens once we pull them from the shelter!